New data reveal that your expected lifespan could vary by as much as two decades — all depending on where you live. 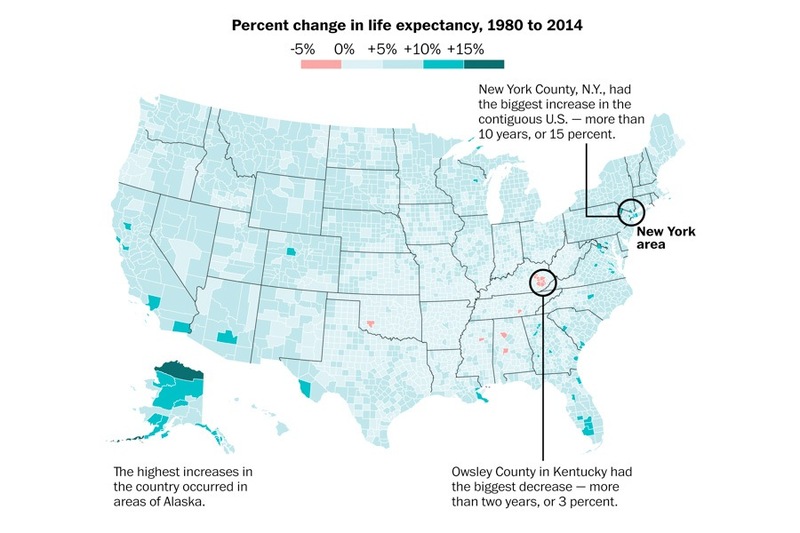 The average American life expectancy can vary by nearly 20 years from county to county, new research shows. According to a study recently conducted by the University of Washington’s Institute for Health Metrics and Evaluation and published in JAMA Internal Medicine, the average American will likely live until the age of 85 in the counties with the highest expectancy, and just 67 in the county with the lowest. Those highest-ranking counties are Summit, Pitkin, and Eagle in Colorado, while the lowest-ranking is Oglala Lakota in South Dakota. 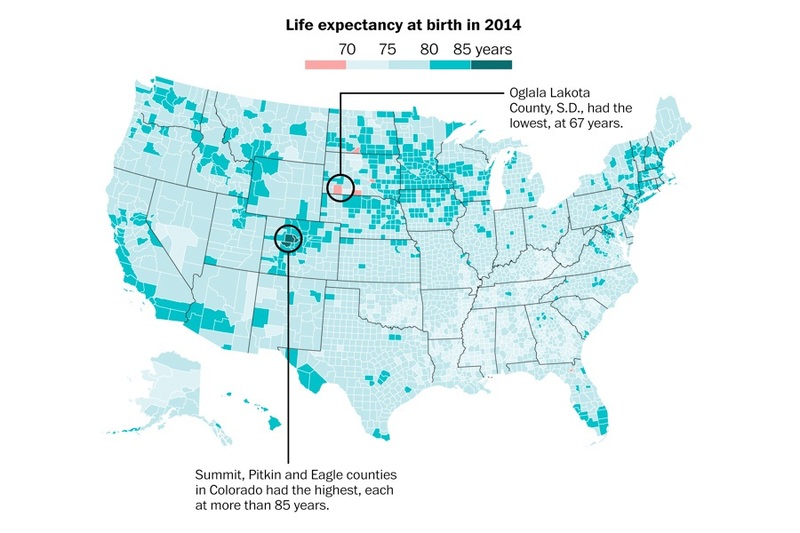 More broadly, the data reveal that Colorado contains many of the counties with the highest life expectancies nationwide and that Oglala Lakota (located entirely within the Pine Ridge Indian Reservation) represents one of just a few outliers in the otherwise high life expectancy areas of the upper Great Plains and western Great Lakes regions. Zooming out even further, the researchers found the largest clusters of high life expectancies in the aforementioned areas, plus California, the Northeast, the Northwest, and south Florida, while the largest cluster of low life expectancies was in the South. Moreover, the study concludes that not only are American life expectancies vastly different from region to region, but that that gap is widening. Uncovering data that mirror the life expectancy numbers, the researchers found that lifespans are growing in places like California, south Florida, and New York (which saw the greatest increase in life expectancy since 1980), while lifespans are shrinking in the South and Appalachia, particularly Kentucky (which saw the greatest decrease in life expectancy since 1980). In these regions of shrinking lifespans — and, in fact, in the US as a whole — the researchers contend that poverty and poor health care are the main culprits. The latter factor has proven especially troubling, with the study’s authors arguing that the US has fallen far behind similarly affluent countries in terms of health care, a matter that is of course before US legislators at this very moment. Next, check out 33 maps that explain American better than any textbook. Then, have a look at 38 U.S. census maps that reveal the true America.